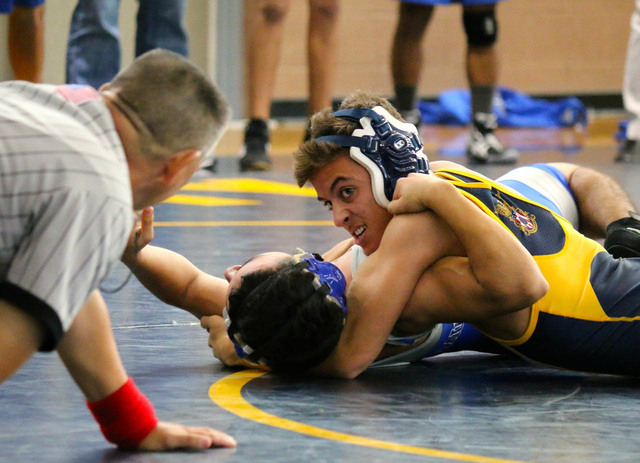 Junior Mike Morelli, at 126 pounds, won four matches, all by pinning his opponent, to lead Team Boulder to a fourth place finish in the Boulder City Duals Invitational Saturday. Morelli, who also won three matches by pin at 120 pounds in a quad-dual meet earlier, was chosen as the wrestler of the week. Desert Hills finished in first place and Faith Lutheran was second in the BC Duals. In Pool A competition, Boulder City defeated Moapa Valley 70-10 and Laughlin 66-15 before losing 42-30 to Faith Lutheran. Team Boulder also was led by Collin Fox (132 pounds), Tyler Rushworth (138) , Nelson Van Diest (195) and Jack Rocyski (275), who were each 3-1. DJ Reese (106), Zayne Dennington (113), Bryan Foster (145), Dylan Viera (152), Dylan Dennington (160) and Alex Pappageorge (170) each were 2-2. In the Dec. 3 quad-dual, Team Boulder won all three matches. The Eagles defeated Mojave 54-18, Legacy 57-22 and Canyon Springs 52-23. Morelli led the team with his three pins, and Jimmy Brown (126), Fox, Rushworth, Foster, Dylan Dennington and Rocyski each were 3-0. Reese, Viera, Pappageorge and Van Diest were 2-1. The Lady Eagles defeated Valley 18-13 Dec. 3 to extend their regular-season winning streak to 20 games. They led 12-6 at halftime and held on for the victory over the Vikings. Their Monday game at Basic was cancelled due to a scheduling conflict, but on Tuesday Boulder City made it 21 straight with its win against Chaparral. Boulder City was ranked as the No. 2 team in Clark County in the Dec. 4 Southern Nevada flag football coaches’ poll released by the Las Vegas Review-Journal. There are 32 teams in the county. A year ago, the Lady Eagles finished fourth in the county after losing in the Sunrise Region final. Defending champion Centennial is ranked No. 3 and Cimarron-Memorial is No. 1. Boulder City’s next home game is at 4:30 p.m. today against Southeast Career and Technical Academy. It is the annual Christmas toy drive game. All the flag football teams in Southern Nevada are collecting toys and participating in 98.5 KLUC’s toy drive. They are asking the community to bring a new, unwrapped toy, gift card or bicycle to the game. Those who do during the varsity, junior varsity or B squad games will receive a free hot chocolate or coffee, and a cookie. For more information, contact coach Chris Morelli at crmorelli.interact.ccsd.net or visit the website at www.bcflagfootball.weebly.com.